The exceptional capability of the Husqvarna Viking Sapphire 835 will be a joy for any quilter. The extended sewing surface offers ample room for large projects such as quilts. Dual lights brighten the sewing surface, eliminating shadows that cause eye strain and making detailed stitching easier. Quilters and crafters will appreciate how the unique EXCLUSIVE SENSOR SYSTEM™ technology detects fabric density for a perfect feed and smooth stitching through uneven thicknesses. The large Graphic Display offers an exciting range of settings to make selecting stitches quick and simple. It will even show the selected stitch in the actual size so you can easily determine if the stitch is right for your fabric. 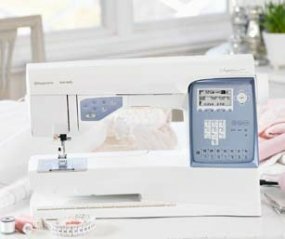 The Sapphire 835 offers over 100 marvelous stitches, allowing endless sewing creativity! The Husqvarna Viking Sapphire 835 has been ranked by Consumer Digest as a Best Buy in Computerized Sewing Machines in the Midrange category.